Attacking Lt Governor Najeeb Jung, the Aam Aadmi Party on Wednesday wrote to him demanding that he and Anti-Corruption Branch chief M K Meena be made ‘co-accused’ in four cases pertaining to alleged scams during the Sheila Dikshit government, including one that is related to prices of natural gas from the KG basin. 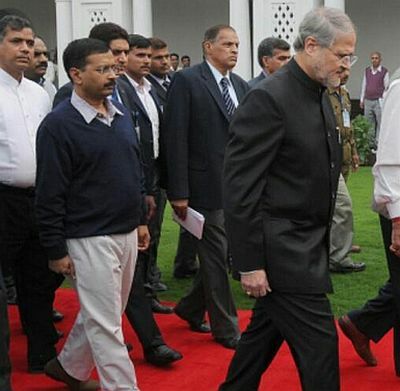 12 AAP MLAs went to Raj Niwas, the LG’s residence, at around 11.30 am with the demands. They later claimed that Jung ‘refused’ to meet them, but the LG secretariat said Jung’s schedule was already prepared for the day and procedures have to be followed for seeking an appointment. The development came after Delhi’s ACB chief Meena said Chief Minister Arvind Kejriwal may also be quizzed apart from Dikshit in the tanker scam case after a first information report was lodged, leaving the AAP and Kejriwal bristling with anger. Accusing Jung of protecting the alleged culprits, AAP MLA Somnath Bharti said that the party has also approached Delhi Assembly Speaker Ram Niwas Goel demanding that the cases be forwarded to the House Committee on petitions, which he said has the power to summon ‘even the LG’. ‘You (LG) have been protecting Smt Dikshit in these four FIRs through your inaction. Shri Meena, imposed by the Union government as ACB chief, has also colluded with you in this criminal activity. ‘Kindly forward my letter to ACB with a direction that Shri Meena and yourself should be made co-accused in these four FIRs,’ a letter signed by AAP MLA Rajendra Pal Gautam said. An official in the LG secretariat received the letter. Bharti claimed that the MLAs were frisked ‘like a terrorist’ at the Raj Niwas and were not given an appointment with Jung though he was present inside the Raj Niwas premises. Kejriwal on Tuesday attacked Prime Minister Narendra Modi over the lodging of FIR linking the AAP government to the multi-crore rupees water tanker scam, alleging it was done at the PM’s behest and asserted that such ‘coercive’ methods would not ‘scare’ him or the AAP into silence.